Home / Health and Fitness / Diets / 'It's Not Tasty' To 'You Don't Get Enough Protein': 10 Vegetarian Myths Busted! We picked the brains of Harley Street's leading UK Nutritionist, Yvonne Bishop-Weston and founder of Explore Raw, Stephanie Jeffs to tell us everything we need to know about this plant-based diet. And the TRUTH may just surprise you! Just because you cut out meat doesn't mean you're guaranteed to eat healthy foods - it's just as easy to lose sight of what you're eating and overeat! Vegetarians can still consume processed foods such as cakes and biscuits (just to name a few) so it's still very easy to indulge in foods that are highly calorific. Take it from Stephanie. She says, "Vegetarians still need to eat a balanced, healthy diet that is rich in a variety of vitamins, minerals, healthy fats, fibre and proteins. Switching out meat for more junk food is the wrong way to go." Shame on you! Vegetarians enjoy a wide variety of foods and in many different forms. It may be odd for meat eaters to think about, because often we think of meat as the main part of our meals, but for vegetarians brightly coloured vegetables, fruits and legumes play a large part of their dishes. And they're anything but boring! Stephanie says, "Exploring a range of amazing vegetarian foods can really awaken the taste buds! Swapping out over processed, over-cooked and heavy meaty dishes for more vibrant plant-based plates can stimulate a new found interest in cooking! Most restaurants cater for vegetarians and vegans and those that don’t have anything on the menu are usually happy to prepare something healthy for you." If your stuck on ideas check out some amazing veggie dishes on Explore Raw and discover your inner vegetarian. We love it! Wrong. Harley Street's leading UK Nutritionist, Yvonne Bishop-Weston says, "When was the last time you heard of someone getting sick because of a lack of protein? Too much fat, too much sugar, too little fibre, too few vitamins and minerals, too little vitamin D, too little essential fats too few vegetables, too much protein (as on the Atkins Diet) but NOT too little. ​"Even if you were a body builder who needed extra protein to bulk up and build muscle you'd be better off with extra hemp protein that comes free with essential fats to build muscle rather that animal protein that comes free with fats associated with a greater risk of heart disease, diabetes and certain cancers." In fact, some of the worlds greatest athletes are vegetarian anyways! Take it from British cyclist, Lizzie Armitstead - it wasn't protein from meat that got her across the finish line...just saying. When you think of vegetarians, do you perceive them as weak and unfit? This is simply not the case. Stephanie says, "Arguably - vegetarians actually have more energy for working out because the body is not having to work hard at digesting heavy meaty meals! As long as the calorie intake from plant-based eating is enough to fuel the body there is no reason why vegetarians cannot workout as much as meat eaters. There are many famous athletes such as Martina Navratilova and Carl Lewis who don’t eat meat." Muscles, endurance and strength are built from exercise. Meat doesn't fuel strength. What we need is nutrients and protein, wherever it comes from. It's a great logic, but it's not necessarily true. It really depends what choices you make. Yvonne says, "If you eat chip butties on white bread, bucket loads of pasta, pizza and soy ice cream washed down with gallons of cola all day then no, there's no guarantee. But if you eat more fresh vegetables and beans then it would be unusual not to lose weight if you are overweight." Case in point - Meat eater or not, if you choose to devour the wrong types of foods then you're sure to see some weight pack on around your waist (which can also be detrimental to your health). We're all on the same boat! Stephanie explains that so long as 'being vegetarian means eating a rainbow of foods that include calorie dense nuts, seeds, proteins and healthy oil sources there should be no need to worry about energy levels!" In other words, there are plenty of vitamins and minerals in a veggie based diet but like any old diet if you make the wrong choices (i.e. junk food) it's true that you can deplete yourself of important vitamins, particularly the trusty B12. If you don't think you're getting enough it's perfectly sufficient to take a supplement. We recommend Quest Vitamins’ new, Vitamin B12 which are suitable for vegetarians and vegans as well. If a quick and easy energy-boosting snack is what you're after, go for a bananas with almond butter. Vegetarian and totally yum - love. Wrong again! In fact studies have found that animal protein is linked to kidney disease, diabetes, cancers and osteoporosis! Which is partly due to the cholesterol-laden meats we eat and the fats associated with it. On the contrary, being a vegetarian comes with tons of health benefits. 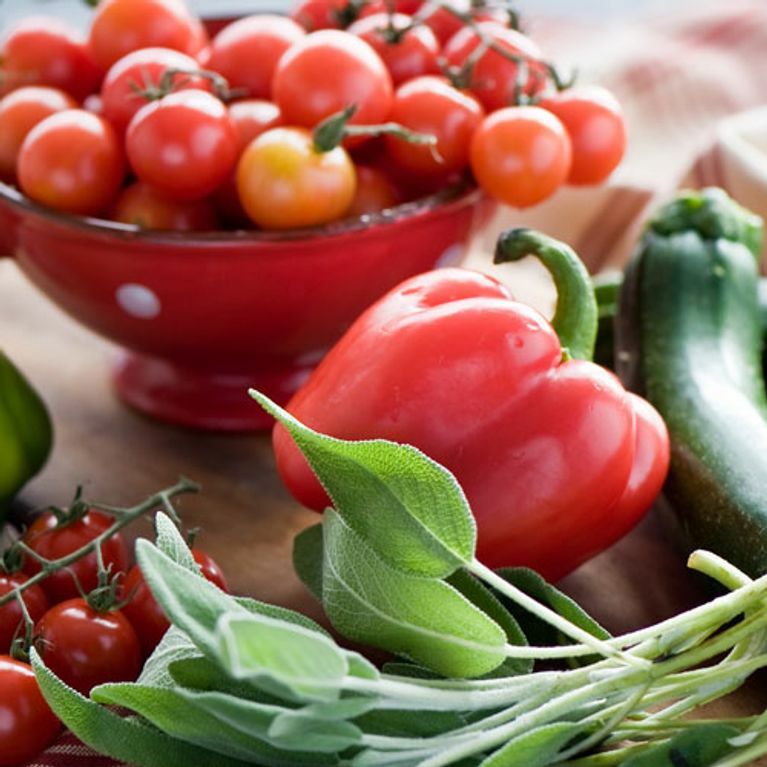 "The main benefits of a vegetarian diet come from eating more fruits and vegetables. There are no important nutrients you cannot get from plants," says Yvonne. "​Even if your traditional diet has made you ill and you need to re-balance there are algae based essential fats, plant based Vitamin D3 and B12, iron and excellent dairy free vegan probiotics to heal your digestion." There's nothing you can't get from a plant-based diet. Being vegetarian is only hard if you make it hard. It's actually one of the simplest and quickest ways to eat! Stephanie says, "From grabbing some of natures fast food (fruits, nuts and veggies) to preparing awesome salads (you just need a knife!) to blending amazing smoothies and making fresh juices to popping potatoes in the oven - once you are in the swing of preparing healthy snacks – it couldn’t be easier – or quicker!" Which means fewer icky dishes left to soak and less washing up. Hurrah. Just because you're vegetarian doesn't mean you're going all organic! Buying from the local farmers market and stocking up on fruits and vegetables can actually be super inexpensive. Stephanie says being vegetarian isn't expensive as long as you avoid pre-packaged foods. "Making awesome veggie dishes at home and filling the freezer with pre-prepared veggie dishes is a frugal and healthy way to eat." And she agrees, it's FAR cheaper than buying meat. Meat is "incredibly expensive if you are buying ‘quality’ cuts from organic sources," which can end up burning a big hole in your pocket. No thank you. 10. 'Switching to a vegetarian diet is difficult"
Stephanie suggests newbies start with "a ‘meatless Monday’ or make regular swap outs in your meals. For example, you can swap out chicken for lentils in a curry, or avocado instead of ham in a salad. ​Making smoothies is a great way to add some fun into your diet! Whizzing up vegetables that you don't usually fancy can taste delicious if you blend it with the right fruits. "Switching-out to tofu or meat-like products can really help! There are loads of veggie meat alternatives in most supermarkets and these foods can really help with the transition." So now that we've busted those myths, what are you waiting for? Go for it - the benefits can be unreal. What other vegetarian myths have you heard Tweet us @sofeminineUK!